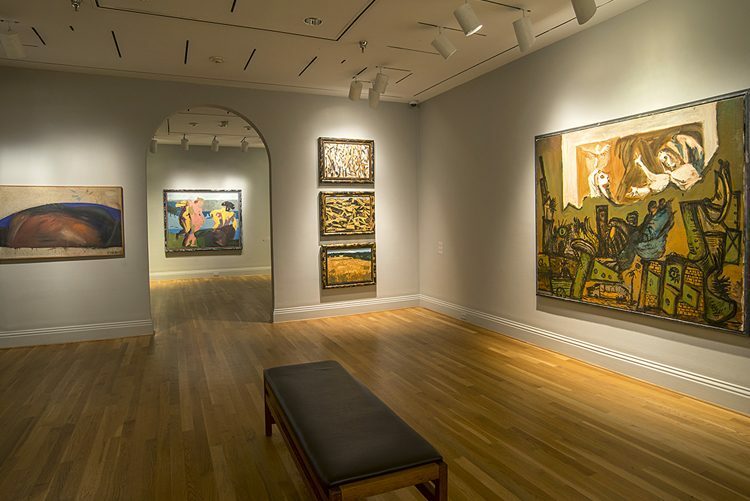 The current exhibition at the Phillips is likely the first encounter many visitors have had with Markus Lüpertz’s work. There are a variety of reasons why Lüpertz has remained relatively unknown in the US to this day. Like his contemporaries, Georg Baselitz, Anselm Kiefer, Jörg Immendorf, and A.R. Penck, Lüpertz’s importance in the German art world has been recognized for decades. Yet, while many of those artists have had major US exhibitions and retrospectives, Lüpertz has yet to break through to American audiences. In many ways, this is a product of Lüpertz’s prodigiousness and the range of his styles, subjects, and approach to art. Kiefer and Baselitz, for example, have both largely maintained a specific style and approach to their art that makes for a more easily digestible viewing experience: one tends to be able to recognize a Kiefer as a Kiefer immediately. Lüpertz went a different route. He’ll offer primitivistic, mask-like faces in one work and faceless, statue-like figures in another. Some works appear totally abstract; others are rife with recognizable objects and imagery. Thus, in place of Kiefer’s ashen, morose surfaces and Baselitz’s upside down, dissolving bodies, Lüpertz, the Unknown Great of German Postwar Art, gives colors, objects, forms—sometimes expressive and evocative and other times withdrawn and unyielding. This entry was posted in Exhibitions and tagged art in germany, artistic style, german artists, Markus Lupertz. Bookmark the permalink.